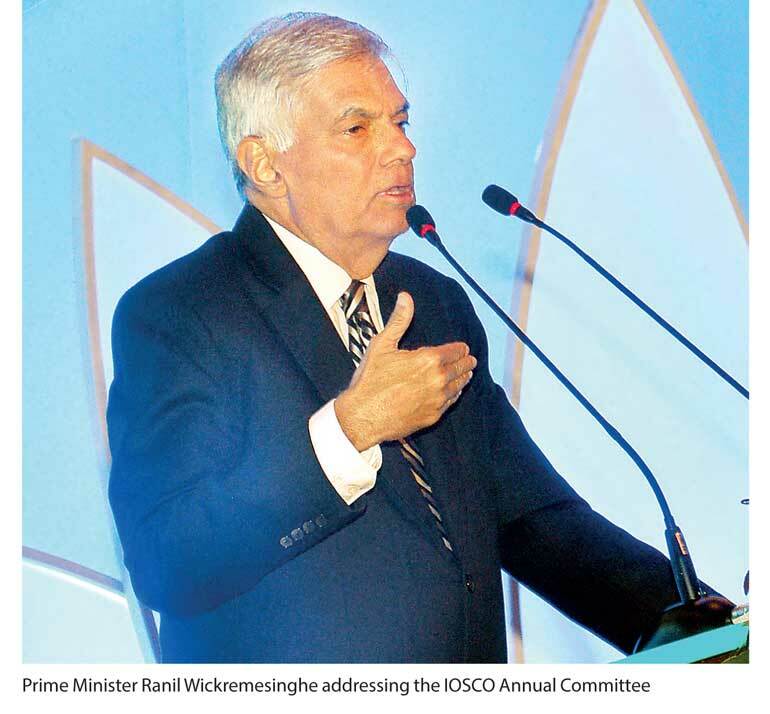 Prime Minister Ranil Wickremesinghe speaking at the International Organization of Securities Commissions (IOSCO) Annual Committee held in Colombo said for Sri Lanka to promote exports and investment, the Government will soon introduce several laws including possible new legislation to improve the ease of doing business. He acknowledged 2018 and 2019 would be crucial years for Sri Lanka, but sounded very upbeat over the economic prognosis due to reforms and expectations of increased investment. However, to boost our exports, trade reforms are now absolutely essential to integrate the economy with the rest of the world. Today there is a dramatic decline in exports to GDP. Sri Lanka’s exports have dwindled due to a lack of competitiveness over the years, from $ 17 billion to $ 11 billion and there is now an urgent need for export diversification. Already for the first five months we have seen a negative growth of 2.5%. Now to improve our competitiveness we need to focus on educating our young people, keep our utility cost down, increase the availability of technology and improve the ease of doing business. At the same time Sri Lanka’s debt has increased to Rs. 9.4 trillion in the last two years, while domestic rates have moved up from 6% to 10.74%. On a domestic portfolio of Rs. 4,277.8 billion (Q2 )there would be an additional cost of around Rs. 202.1 billion and for the new borrowings, the total cost would be Rs. 113.25 billion. An amount of more than Rs. 315 billion would be required to pay back interest. Repayment of the foreign debt as at 1 January 2015 was Rs. 3,132 billion, this has now moved up to Rs. 4,070 billion. Furthermore USD to LKR in January 2015 was 131.00 and by August 2017 USD to LKR was around 154.50. This FX depreciation of around 16% is now having huge implications in all sectors. We cannot allow interest rates to move up and LKR to depreciate this way, any more. To get out of this FX crisis it is best that we start focusing on increasing our export income and tourism income using the 60+ embassies oversees. The Government has aggressively looked to sign up FTAs with China, India and Singapore to boost our export growth and FDIs. In fact the Prime Minister has many times said that the Economic Cooperation and Technical Agreement (ETCA) with India that will be signed soon will enable Sri Lanka to have closer engagement with India, especially the five southern states, which together with India are the fastest growing segment of the Indian subcontinent and at the moment have a combined GDP of $ 500 billion. He also said Sri Lanka is negotiating another FTA with Singapore and they are very receptive because they believe that Bay of Bengal countries will be fast-growing countries with fast-growing incomes in the next 20-30 years. Apart from the Chinese One Belt initiative with China, Sri Lanka is also negotiating a FTA and a comprehensive economic partnership dialogue with Japan. The Prime Minister’s move to fast track the FTAs with Singapore and China and ETCA with India is with a view to generate new investments and jobs. He knows we cannot protect our economy by stagnating behind tariff walls. The best protection possible is a mutual lowering of tariff barriers among friendly nations so that all may benefit from the free flow of goods. Increased economic activity resulting from increased trade will provide more job opportunities for our young workers. Our industry, our agriculture, our services will benefit from increased export opportunities as other nations agree to lower their tariffs. Increased exports and imports will benefit our ports, steamship lines and airlines as they handle an increased amount of trade. Lowering our tariffs will provide an increased flow of goods for our consumers. Our industries will be stimulated by increased export opportunities and because of the competition from other nations, we will be forced to develop an efficient, economic and productive system. We need to usher in a new era of export growth unlike in the past, where exports dwindled and Sri Lanka had to rely more on remittances and foreign loans. Exports are probably part of the answer of where we will find job growth. However, the issue of exporting our way to job growth is harder than it appears despite the GSP+ concessions. When a country exports goods, it sells them to a foreign market, that is, to consumers, businesses, or governments in another country. Those exports create opportunities and brings foreign money into the country, which increases the exporting nation’s GDP. So at a time when good jobs are in short supply, building exports is an imperative. But as we boost our exports we will have to start producing more goods that are more labour intensive, that way as exports grow it will become a more productive engine. Therefore job growth isn’t just about where jobs are today; this is where jobs for our young Sri Lankans will be tomorrow. They need to become job ready. Today the world’s powerful customers and fastest growing markets are beyond our borders. So if we want to find new growth opportunities, if we want to find new markets and new business opportunities, we’ve got to compete for those new customers—because other nations are competing for those customers day and night. More compelling for free trade is the dramatic upturn in GDP growth rates in India and China after they turned strongly towards dismantling trade barriers in the early 1990s. In both countries, the decision to reverse protectionist policies was not the only reform undertaken, but it was an important component. In developed countries, trade liberalisation, which started earlier in the post-war period, was accompanied by other forms of economic opportunities for example, a return to currency convertibility, resulting in rapid GDP growth. Moreover, the argument that historical experience supports the case for protectionism is now flawed. The economic historian Douglas Irwin has challenged the argument that 19th-century protectionist policy aided the growth of infant industries in the United States. Nor should the promoters of free trade worry that trade openness results is chaos for some developing countries. Trade is only a facilitating device. If a country’s infrastructure is bad, or have domestic policies that prevent investors from responding to market opportunities such as corrupt practices and licensing restrictions, very little progress can be achieved. Every major trading nation today is actively negotiating bilateral and regional Free Trade Agreements (FTAs). In the final analysis, if the FTAs can be pushed through, we will soon have access to a three billion market of consumers. But to survive and grow in that market, we need to create an ecosystem that would help Sri Lanka to ride that wave. To do that we need the political will and a private sector that stands ready to do business with the world.